If necessary, click the link to Pick another restore point. Use the calendar control to choose from the available dates when restore points were created — they are marked with blue square outline; if more than one restore point per day was created, select the required time on the right. If you backed up archived redo logs for the database, you can also select the required Point in time using the timeline and the slider. For more information on log backup, see Preparing and Application-Consistent Backup. If previous restore point (server backup) was not found, or database backup does not exist in it, then Beginning will refer to current restore point. If next restore point (server backup) and corresponding transaction log backup were not found, or if database backup does not exist in server backup, then End will refer to current restore point. If next restore point (server backup) was not found, but transaction log backup exists for the preceding period, then End will refer to the latest log backup time. To specify target location, click the Destination link. Specify the location where you want the database items to be restored. 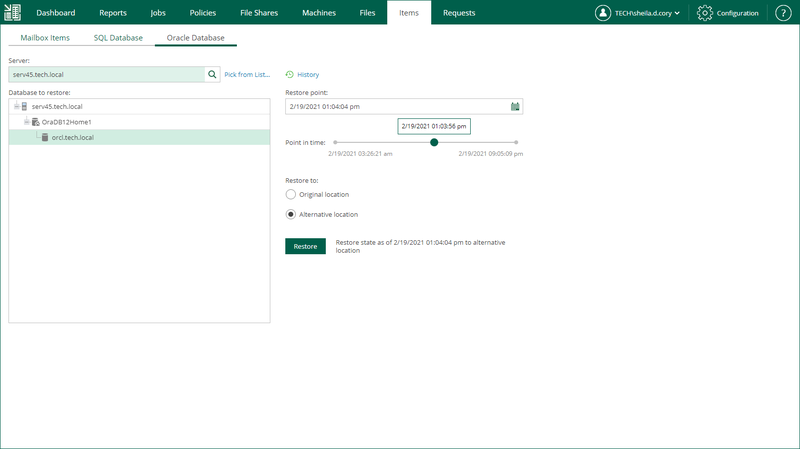 Firstly, Veeam will try to use the account of the backup job that contains Oracle server machine, or the account which is currently logged in. If this account does not have sufficient rights to perform the restore procedure (for example, in case of imported backup), you will be prompted to supply the necessary credentials. Make sure the account has access to the original machine guest OS (Windows or Linux); if restoring an Oracle 12 Database on Windows server, then you may need to enter password for Oracle home. Specified account’s role in the Enterprise Manager should allow that user to restore Oracle databases. For more information, see Providing Access Rights. Another option is Restore to alternative location, described in the next section. If restoring to the original location, this will start the restore process. If restoring to another location, this will launch restore wizard for you to follow. For more information, see Using Oracle Restore Wizard.